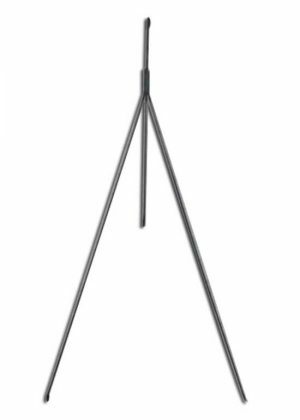 Want a little more than just the Basic Setup? 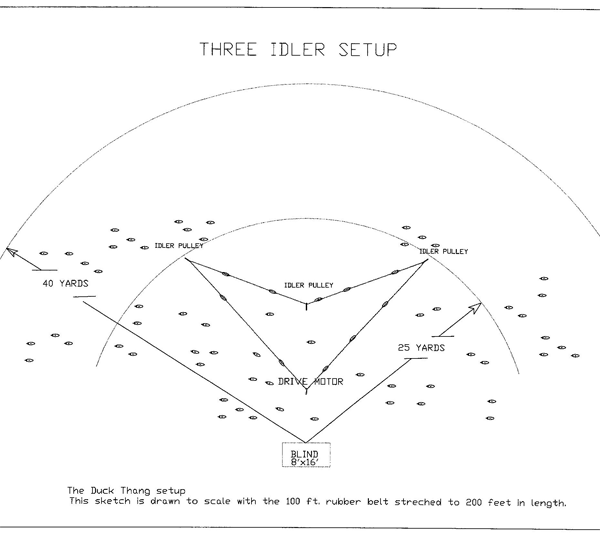 Step it up a bit with the 3 Idler System. It gives your spread more motion than the Basic 2 Idler System, and includes a 100 foot belt. We have made a design change on the idler pulleys which is a major improvement. If you are a recent customer, contact us – we will replace or modify your “old style” pulleys at no charge if you send them to us. The Duck Thang is the only waterfowl decoy motion system available capable of swimming dozens of decoys in a lifelike manner. With the new Duck Thang waterfowl Decoy motion system, a duck or goose hunter can now enjoy the thrill of hunting over a spread of live decoys legally. The Duck Thang is powered by a 12 volt DC deep cycle battery. The Duck Thang is driven by a heavy duty, industrial grade gear motor and will run all day on a fully charged battery. Repair parts for the motor are available if needed. The drive motor assembly has a rotating pulley which drives the elastic drive belt in continuous manner around a series of idler pulleys. The idler pulley assemblies and the drive motor assembly are mounted on metal tee posts driven into the bottom of the pond. 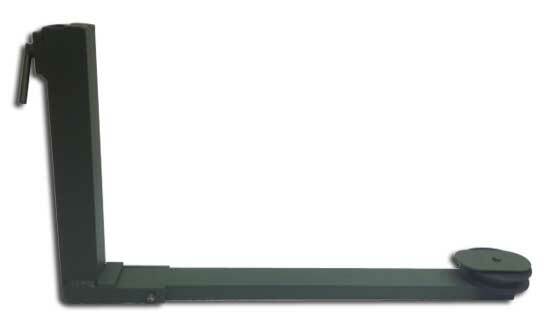 The decoy motion system comes with seven idler pulley assemblies and more can be added as an option. The flexibility of the elastic drive belt allows the hunter to place the idler pulley assemblies in an endless array of possibilities. 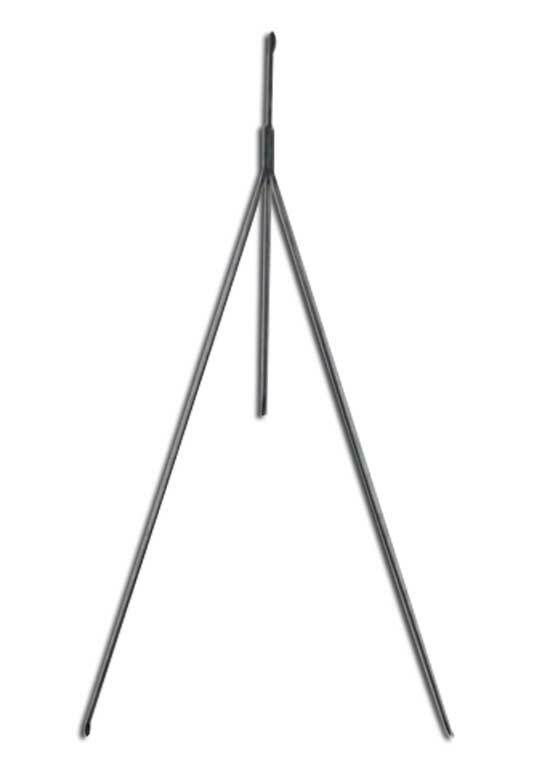 The motion system is made in the USA of quality components. The motion system is reliable and designed to provide years of service. The motion system has been field tested for the last two years by serious hunters and professional waterfowl guides. The swimming action created by the motion system adds a new dimension to waterfowl hunting. On slow days, it provides a form of entertainment by the realistic way the decoys move. Hunters are not bored by a lifeless spread of decoys and are able to experience a rewarding day in the field and enjoy the fine camaraderie so unique to water fowling. The Duck Thang is a revolutionary new decoy motion system. 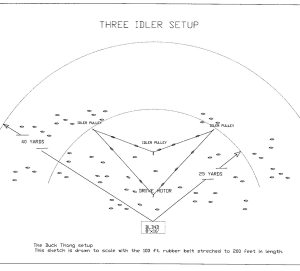 The 3 Idler System. It gives your spread more motion than the Basic 2 Idler System, and includes a 100 foot belt. Or you can upgrade by choosing the 200 foot belt option, giving your decoy spread even more range. We have made a design change on the idler pulleys which is a major improvement. If you are a recent customer, contact us – we will replace or modify your “old style” pulleys at no charge if you send them to us.